Acclaimed General Lloyd Fredendall lost his command after the debacle at the Battle of the Kasserine Pass. He came highly recommended, praised by General George C. Marshall as “one of the best.” But ultimately from these high hopes and expectations would come disastrous failure. Maj. Gen. Lloyd R. Fredendall would go down in history as one of the most unsuccessful American generals of World War II. Up against the German Army in North Africa, he would all but collapse. Out of humiliating defeat one of America’s most successful generals, George S. Patton, came to the fore. After flunking out of West Point and then dropping out after a readmission, Fredendall received his commission as a second lieutenant of infantry in 1907. Among other stateside and overseas assignments, he served in the Philippines and eventually in France during World War I. He earned a reputation as an excellent trainer and administrator but did not serve in combat during the Great War. By the time of Operation Torch, the Allied invasion of North Africa on November 8, 1942, Fredendall was a major general in command of the Central Task Force landings at Oran. In a letter to Marshall on November 12, 1942, Eisenhower stated, “I bless the day you urged Fredendall upon me and cheerfully acknowledge that my earlier doubts of him were completely unfounded.” It would prove to be an ironic statement. There were already real potential problems looming. Fredendall did not like the British or the French. Considering those were the nationalities he would be fighting alongside, it did not bode well for the campaign ahead. It was in Tunisia that Fredendall would fail. The German and Italian troops of Panzerarmee Afrika, under General Erwin Rommel, had been routed at El Alamein in Egypt, retreating 1,400 miles westward into Tunisia by January 1943. Following the Torch landings, Hitler had ordered reinforcements sent to North Africa, and soon German and Italian troops were being ferried from Sicily into Tunisia. Notable among these was Hans-Jurgen von Armin’s Fifth Panzer Army. After suffering ignominious defeat and the retreat that followed, Rommel was eager to achieve a victory and, always looking for the enemy’s weak point, he found it—the inexperienced and untested American II Corps. Major General Lloyd Fredendall converses with French officers in North Africa during a briefing. 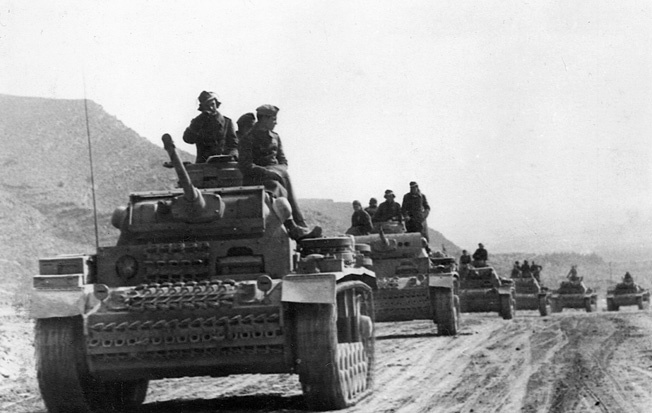 The Allies had advanced from the African coast into Tunisia, reaching the edge of the Eastern Dorsal Mountains. The British First Army under Lt. Gen. Sir Kenneth Andersen held the northern sector, with the Free French of 19th Corps D’Armee in the center, and Fredendall’s U.S. II Corps at the southern end of the line. There were signs of trouble ahead. In the early morning hours of January 30, a force of 30 panzers broke through the Faid Pass and struck the French positions there, with another force of tanks and infantry circling south and coming up behind the defenders. The French plea to the Americans for help resulted in a shambles. A force too small for the task under U.S. Brig. Gen. Raymond McQuillin moved slowly forward before halting for the night. The next day 17 American Sherman medium tanks rolled directly into a trap and were devastated by German 88mm guns. An infantry counterattack the next day also failed, and the pass remained in German hands. The French, suffering losses of 900 men killed or missing, were furious at the Americans. The entire ordeal revealed problems in American command and tactics, but the disastrous rude awakening that would spark the sweeping changes desperately needed was yet to come. “It was the only time during the war that I ever saw a higher headquarters so concerned over its own safety that it dug itself underground shelters,” Eisenhower remarked later. At the front the situation was also alarming. Eisenhower arrived at the crossroads village of Sidi Bou Zid, where the 1st Armored Division and the 34th Infantry Division were positioned because of the enemy capture of Faid Pass on January 30. He found no defensive minefields laid down, only excuses as to why not, and assurances the job would be done tomorrow. It was an example of a troubling lackadaisical attitude among the American troops there. Fredendall did not go up to the front line, instead relying on maps at his headquarters and issuing orders over the radio. That was undoubtedly a factor in the woeful unpreparedness at the front line in the American sector. Moreover, the fact that he was always in the rear was noted by his men, who called his headquarters “Speedy Valley,” “Lloyd’s very last resort,” and “Shangri-la, a million miles from nowhere.” Inevitably, the situation affected morale and severely eroded the confidence of Fredendall’s men in their leader. General Lucian Truscott had this to say about Fredendall: “Small in stature, loud and rough in speech, he was outspoken in his opinions and critical of superiors and subordinates alike. He was inclined to jump to conclusions which were not always well founded. Fredendall rarely left his command post for personal visits and reconnaissance, yet he was impatient with the recommendations of subordinates more familiar with the terrain and other conditions than he.” Fredendall routinely ignored intelligence reports, bypassed subordinate commanders, and micromanaged troop dispositions down to company level. 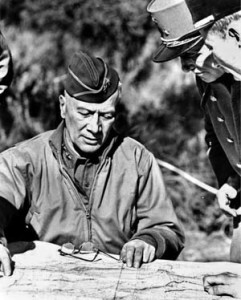 When Ike visited the II Corps units near Sidi Bou Zid on the night of February 13, he had no idea that within hours the Germans would launch an offensive under Rommel and von Armin that would unleash a disaster for the Americans. Fredendall, against the advice of his 1st Armored Division commander, Maj. Gen. Orlando Ward (whom Fredendall disliked and so deliberately ignored) and others, had kept American forces spread thinly along the front instead of maintaining a strong mobile force to counter any German attack—wherever it might happen—or take swift advantage of an opportunity. Time had run out to organize such a mobile force. The next day, February 14, the Germans attacked, and all hell broke loose. 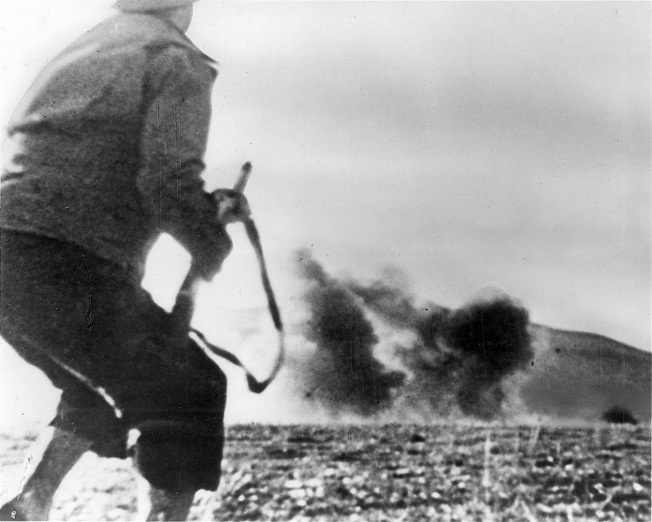 A German artillery shell shocks an American soldier on the battlefield in North Africa. Early encounters with the Germans resulted in stinging defeats for the U.S. Army. Things rapidly fell apart for the Americans. Everything seemed to go wrong. The lack of discipline under Fredendall’s command came to a head with the German onslaught, and Fredendall’s actions in the battle speak for themselves. At his headquarters, well back from the fighting, Fredendall was unable to control the situation. From Djebel Lessouda and Djebel Ksaira, two hilltop defensive positions Fredendall had ordered set up which flanked Sid Bou Zid and were too far away from each other to offer any mutual support, American soldiers could only watch helplessly as the Germans rolled over their comrades below while panic spread rapidly amid the savage mauling. An understrength counterattack by the Americans on February 15 failed, Sidi Bou Zid had to be abandoned, and the Americans on Djebel Lessouda and Djebel Ksiara were cut off. By the time Fredendall issued orders for the hilltop defenders to break out it was too late. Although they tried to make it back to Allied lines, only 300 of the original 900 men made it. One of those taken prisoner was Lt. Col. John Waters, General Patton’s son-in-law. The attack quickly turned into a rout. Panicked American troops, only wanting to escape the maelstrom, fled in chaotic pandemonium rearward under terrifying attacks by Junkers Ju-87 Stuka dive bombers. Forced back 50 miles, disorganized and demoralized by the stinging defeat, the Americans fell back to the Kassarine Pass, which pierced the Western Dorsal Mountains and provided a gateway for the Germans to slice into the Allied rear areas. After more heavy fighting, the Germans did manage to get through Kasserine Pass. The arrival of Allied reinforcements combined with the Germans’ own command problems to grind the offensive to a halt. In just 10 days the Americans had lost 183 tanks and 7,000 men, including 300 killed and 3,000 missing. A column of German PzKpfw. III tanks rolls along a dirt road in North Africa. When American troops of the II Corps came up against the German veterans, the initial results were disastrous. The American commander, Maj. Gen. Lloyd Fredendall, was also found unequal to the task of leading troops in combat. It was the start of a turnaround that resulted in victory at El Guettar in the eight-day Allied offensive that began just 10 days after Patton took command. 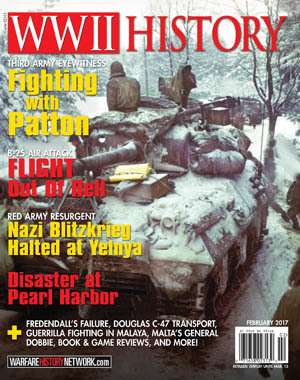 The Americans had learned a hard lesson well, and the painful but eye-opening experience of February 1943 ultimately paid off for them for the rest of the war. For Lloyd Fredendall, however, the fighting was over. He was sent back to the States, where he remained for the duration, training men. He retired in 1946 and passed away in 1962, at the age of 79. The fighting in February 1943 became known as the Battle of Kasserine Pass, a humiliating experience for the Americans although it must be remembered that many U.S. soldiers fought bravely and tenaciously in the chaos and confusion. Not all of the blame for the disaster of Kasserine can be laid on Fredendall’s shoulders; there were other factors behind what happened. One was the reality that the American soldiers at that point were inexperienced—something beyond anyone’s control. There was also a widespread overconfidence among them. Anything Fredendall or anyone else could have done to alter their unrealistic mind-set that a quick and easy victory lay ahead likely would not have had much effect. Still, Fredendall was largely culpable in what happened. He violated command structure and kept commanders in the dark by withholding vital information, bypassing them, and causing confusion. He was more interested in his own safety than in being constantly aware of what was happening at the front. The fact that he issued orders worded in incomprehensible nonsense was bizarre without question. How could a U.S. Army general act in such a way? He isolated himself from his men and was responsible for an appalling lack of discipline. Fredendall sounded like a fighting general, and with his exemplary service record prior to World War II he seemed a likely success. But battle makes short work of hype or false bravado, and it made short work of Lloyd Fredendall. Author Jerome M. Baldwin is a resident of Amherstburg, Ontario, Canada. He is a veteran of the Canadian Army, having served as a fire control systems technician. Tags 88mm gun, Afrika Korps, Allies, Axis, Battle of El Alamein, Djebel Lessouda, Dwight D. Eisenhower, El Alamein, Erwin Rommel, Fifth Panzer Army, Free French Army, General George C. Marshall, General George S. Patton, General Omar Bradley, John Waters, Ju-87 Stuka, kasserine pass, Lloyd Fredendall, Mediterranean, north africa, Operation Torch, Orlando Ward, Panzer Army, Tunisia.